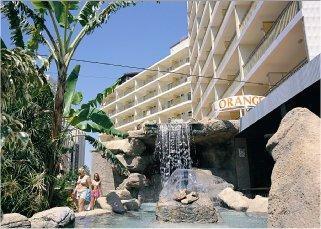 The Hotel Orange is operated by Servigroup and is located just 250 yards from the Levante Beach in Benidorm. Facilities include air-conditioned restaurant, bars and lounges, sun terrace with swimming pool, including sun beds and parasols, bar and garden area. 247 fully equipped rooms: air-conditioning and heating by fan coil system, bathroom, balcony (except single rooms), telephone, television & safe. The hotel itself was absolutely fab, recently refurbished to a high standard, the food was excellent as were the rooms with great air conditioning. My husband and myself both in our forties were not at all bothered by its central location to the night clubs and discos however if you land on a room on the front it could be noisy, we would go back again tomorrow.